Cascade's senior management team gathers at the firm's plant in Kent, Wash. In front, from left, Michael Moran, general manager, and Karen Leonhardt, customer service manager. in back, from left, Sherzad Ahmed, production manager; Jean Nordyke, quality manager; Jill Soria, human resources manager; Kenny Hubach, operations manager; and Bob Walker, special projects manager. 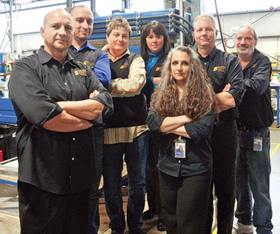 KENT, Wash.—Cascade Gasket & Manufacturing Co. Inc. simply doesn't go with the flow. It forges its own path. Formed in January 1946 by entrepreneur Franklin (Mart) Terry, it has the capabilities to serve a number of segments. But its main concentration is on aerospace. And within that sector, it focuses on Boeing Co. and firms that make subassemblies for the Chicago-based aircraft maker. “By staying focused on a world leader in the aerospace industry such as the Boeing Co., we strategically align our business, technology and manufacturing systems with theirs,” said Cascade General Manager Michael Moran. “Boeing is the reason we are so successful and can offer our customers many valuable intangible benefits. A custom producer of molded rubber and foam products, die-cut gaskets, sheet packing and metal shims, Cascade occasionally does make components for customers in the military, construction, marine and electronics industries, Moran said. But combined, they make up less than 1 percent of Cascade's sales. “Over the past 65 years, we have sold to every industry at some level, but that creates lots of different business processes to contend with, and that reduces our throughput time,” he said. Cascade specializes in Boeing Aerospace Certified Rubber Compression Molding, working with small parts and large components. It works with organic rubber, silicone compounds, polypropylene, polystyrene and polyurethane. The firm is ISO 9001:2008, AS-9100 and AS-9102 certified. About 25 percent of the compression and injection molder's sales are directly with Boeing, according to Moran, while most of the other 75 percent of its customers make subassemblies for aircraft. Moran points to quality, on-time delivery and engineering as other key reasons Cascade has been successful. That, plus the fact it has taken lean manufacturing to the maximum level in the last 10 years, has made it very responsive to customers' needs, he said. Boeing was willing to work with Cascade to help improve processes by exposing flaws. Boeing's “Teaming for Success” initiatives gave any willing participant a way to look at how a product was being processed. “We embraced those meetings and set out to be the example company for our customers to show their supply base and even their customer base,” he said. Competition has grown in the aerospace industry since 2007 and 2008, when it was limited for rubber seals and gaskets. Back then, however, companies were struggling to understand new aerospace requirements, Moran said. Today, the volume of competitors has doubled and includes firms from countries that typically have not been on the aerospace side of the rubber market. Cascade also has a strong, experienced management team headed by Lee Terry, who has been at the helm as president since 1999 after serving as general manager for 10 years. Her father and company founder, Mart Terry, remained with the firm as CEO when she took over as president. He passed away in August 2009. 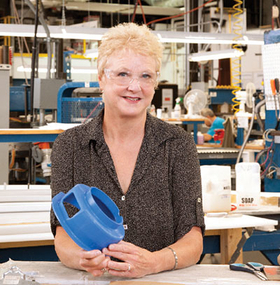 “Cascade Gasket is the result of my father's dream for a company that offers the right product, of the right quality, at the right price, at the right time,” she said. Since 2004, she said, her vision and direction “is to keep impressing our customers, suppliers and the community with a multitude of intangible, yet extremely valuable, services. We set a standard of excellence that we enjoy sharing and continually improving upon. Moran, with an extensive lean manufacturing background, joined the firm in 2004 as general manager. During the last 10 years, Cascade has increased its business and the size of its operation significantly. In 2004 its plant totaled about 14,000 square feet; today it has more than doubled to 32,000 square feet. It had sales of $3 million and employed 40 people 10 years ago compared to its current revenue of $21 million annually and work force of 160. Its customers are used to expedient, outstanding customer service and order fulfillment from the companies they patronize in their personal lives, Moran said. The firm's goal is to provide them with that same experience when ordering rubber seals and gaskets. Cascade has focused on cost-down initiatives since 2004, which has transformed its culture and made it very cost-effective and nimble, he said.